Throw your cares away in the tropical, colorful Plantation Teak Outdoor Club Chair! Whether as a single unit or as part of a collection, the Plantation Outdoor Lounge Chair is a superb addition to your veranda, patio or garden. W39" x D32" x H38"
The Plantation Teak Outdoor Furniture Collection is simple, compact and unique, evoking the essence of furniture you might see in early 20th Century sugar cane plantation fields in places like Indonesia, where your Grade A Teak comes from! Showcasing masterful craftsmanship with the delicate, clean slatted design; each piece flares out at the top, creating a welcoming and warm quality that you’ll be happy to dive into. The Plantation Outdoor Club Chair can be placed in a quiet nook for private relaxation, or as part of a more extensive set. Try placing two Plantation club style outdoor lounge chairs on either side of the Plantation Outdoor Sofa. Add an accent table to finish off the look, and you will have a stunning, vivacious area that you will be proud to call your own. At Teak Warehouse, we pride ourselves on offering a range of chic and diverse products, made of the highest quality materials. 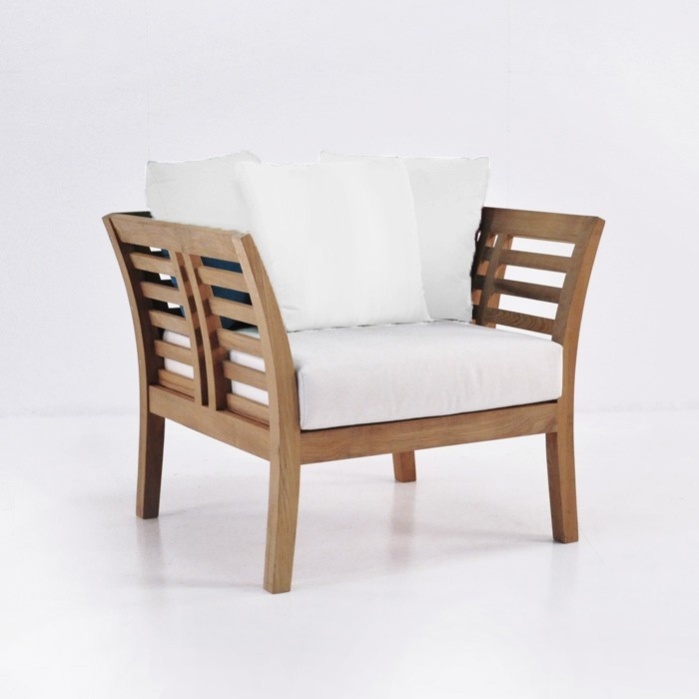 The Plantation Teak Outdoor Club Chair is constructed from highly sought after A-Grade Teak, marine grade stainless steel fixings and epoxy glue, and dressed with acclaimed, gorgeous Sunbrella® cushions! Comes with FREE Sunbrella® cushions!